Manchester United are unlikely to sanction the sale of midfielder Paul Pogba to Real Madrid unless the Bernabeu outfit are prepared to offer Toni Kroos and Gareth Bale in a part-exchange deal. Pogba has recently revealed his dream of playing for the European champions and the speculation has since heightened with Los Blancos boss Zinedine Zidane expressing his interest in the Frenchman. According to AS, United are aware of Los Blancos' interest in the World Cup winner but they are unlikely to permit Pogba's departure unless they can pursue both Kroos and Bale in a summer agreement. 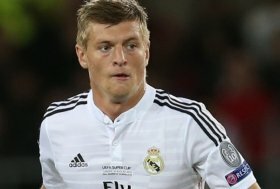 Kroos is apparently considered as a like-for-like replacement for the Frenchman while Bale is regarded as an option, who could solve the club's struggles on the right side of the attack. Manchester United secured a 2-1 win over Watford at the weekend despite being second best for most of the game. The result has propelled them to the fourth spot, though Arsenal could leapfrog them by beating Newcastle United on Monday night.